David Peacock, who has been the treasurer for the garden since its inception, is stepping down because he is moving out of the neighbourhood. 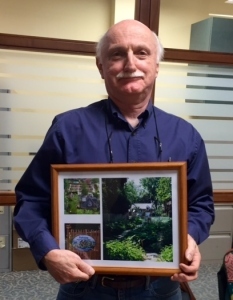 The leadership team, and all of the volunteers, sincerely thank David for all of his contributions to the garden. Not only was he treasurer, but he also built the cold frames, participated in building the compost bins, and was our “Mr. Fix-it” for minor repairs around the garden and stable. He will be missed!